3 Chihhsiong Shih, Yuanfan Yang, “View planning and mesh refinement effects on a semi-automatic 3D photorealistic texture mapping procedure”, Optical Engineering, Vol.51, No.02,2012. 6 Chihhsiong Shi(石志雄)h, Pao-Ann Hsiung, Chieh-Hao Wan, Chorng-Shiuh Koong, Tang-Kun Liu, Yuanfan Yang, Chu-Hsing Lin, William Cheng-Chung Chu, “Integration of a vision-based tracking platform, visual instruction, and error analysis, models for an efficient billiard training system” , Journal of Optical Engineering, 48(2), 027202 Feb. 2009(SCI, EI), JCR Impact Factor:0.757,(Five Year Impact Factor:0.939) Rank:35/64. 7 Pao-Ann Hsiung, Shang-Wei Lin, Yean-Ru Chen, Chun-Hsian Huang, Chihhsiong Shih(石志雄), and William C. Chu, “Modeling and Verification of Real-Time Embedded Systems with Urgency”, Journal of Systems and Software, April 2009, (SCI, EI) JCR Impact Factor:0.799, Rank:44/84. 8 Chieh-Hao Wan, Chun-Lin Wu, Meng-Tsun Lin, Chihhsiong Shih(石志雄), “New Electrocatalysts for Unitized Regenerative Fuel Cell: Pt-Ir alloy deposited on the proton exchange membrane surface by impregnation-reduction method”, Journal of Nanoscience and Nanotechnology, April 2009, (SCI, EI), JCR Impact Factor:1.987, Rank:18/47. 9 Chihhsiong Shih(石志雄), Lester A. Gerhardt,William Cheng-Chung Chu, Chuhsing Lin, Chih-Hung Chang, Chieh-Hao Wan,”Non-uniform surface sampling techniques for 3D object inspection”, Journal of Optical Engineering, 47(4), April 2008. (SCI, EI) , JCR Impact Factor:0.897, Rank:31/56. 10 Chihhsiong Shih(石志雄), Lester A. Gerhardt, “The Integration of View Planning with non-uniform Surface Sampling Techniques for 3D Object Inspection”, Journal of Optical Engineering, 45(11), 113602 Nov.2006 (SCI, EI), JCR Impact Factor:0.897, Rank:31/56. 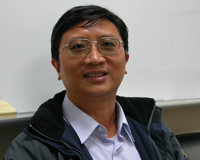 11 Chieh-Hao Wan, Qing-Huang Zhuang,Chien-Heng Lin,Meng-Tsun Lin, Chihhsiong Shih(石志雄)，”Novel composite anode with CO’Filter’layers for PEFC”, Journal of Power Sources 162, p.41-50, 2006. (SCI, EI) JCR Impact Factor:3.521, Rank:43/62. 1 Chihhsiong Shih, Bwo-cheng Liang, Cheng-zu Lin, Nien-Lin Hsueh, Pao-Ann Hsiung “An Automatic Smart Shopping Cart Deployment Framework based on Pattern Design”, Singapore, ISCE 2011. 3 Chihhsiong Shih, Tang-Kun Liu, Cheng-Yao Lin, Yuanfan Yang, “A Best View Planning Based 3D Full Detail Textured Model Reconstuction Process Through DLT Mapping Algorithm”, CVGIP, SiTou, Taiwan, Aug. 2009. 4 Chihhsiong Shih, Chien-Ting Wu, Cheng-Yao Lin, Pao-Ann Hsiung, Nien-Lin Hsueh, Chih-HungChang, Chorng-Shiuh Koong, William C. Chu, “A Model-Driven Multicore Software Development Environment for Embedded System”, IEEE QUORS,Seattle, USA, July 2009. 5 Chorng-Shiuh Koong, Ching-Meng Lee, Deng-Jyi Chen, Chih-Hung Chang, Chihhsiong Shih, “The Visual Authoring Tool of Flash-Based Component for Interactive Item Template”, Hawaii, USA, Mar. 8~12, ACM SAC2009. 6 Chihhsiong Shih, Tang-Kun Liu, Yuanfan Yang, “AVISION BASED BILLIARD BALL TRACKING PLATFORM, MOTION ANALYSIS STRATEGYAND THEIR INTEGRATION FOR A RELIABLE BILLIARD TRAINING SYSTEM”, Yilan, Taiwan, Aug 26~31, CVGIP, 2008. 9 William C. Chu, Chih-Hung Chang, Chih-Wei Lu, Chihhsiong Shih, Ya-Wen Cheng,” Model-based Object-oriented Requirement Engineering(MORE) to support Software Maintenance”,2007 OOTA, Sep., Tainan, Taiwan,2007. 10 Chihhsiong Shih, William C. Chu, Yuanfan Yang,”Automatic photorealistic texture mapping of the fine detail 3d model using direct linear transformation and perspective projection technology”,Kaoshiong, Taiwan, CGW, August, 2007. 15 Chihhsiong Shih,“Efficient photogrammetry view planning algorithm for 3d building full-color model reconstruction”, CVGIP, Wan-li, Taiwan, 2005. 2 石志雄,陳合興,楊遠凡,”EBT 聚合膠片使用近接放射治療之劑量量測與分析軟體建置”, 97 年度榮東合作研究計畫成果報告, 計畫編號：TCVGH-T977802. 3 石志雄,楊遠凡,劉棠錕 ,”探討光流成像技術(Optical Flow)對自動化三維未知模型細部全彩重建之影響”, "National Science Council,”, NSC96-2221-E - 029 - 009 -, 2007. 5 石志雄,楊遠凡,方宣詠,”探討最佳攝影測量角度規劃及再投影立體成像技術對三維細部全彩模型重建自動化之影響”, "National Science Council,”, NSC95-2221-E-029-043, 2006. 6 石志雄,楊遠凡,方宣詠,”探討透視投影貼圖技術對細部全彩模型重建自動化之影響”, "National Science Council," NSC 94-2218-E-451-006, 2005.